A future for modifying the Farmington Hill approach? An assemblage of the Colorado Department of Transportation’s Region 5 employees was greeted this month by a contingent of dissidents voicing their opposition to the agency’s proposal of connecting US 550 to US 160 at the Bridge to Nowhere. Most of the dissidents were a group of engineers organized by landowner Chris Webb, whose property would be condemned, and a canyon then bulldozed and excavated into it in order to align US 550 with the Bridge to Nowhere. 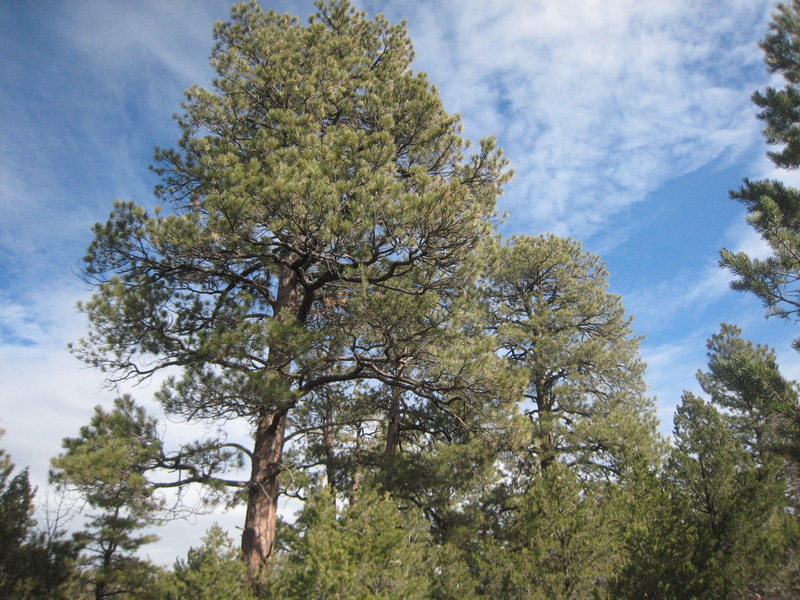 A ponderosa pine stand on the Webb Ranch that would likely be taken out if CDOT implemented their preferred future alignment of US 550 at the Bridge to Nowhere. But the transportation director for CDOT and a small group of people living on Farmington Hill or south of there gave support for the engineering and safety appeal of using the Bridge to Nowhere as the connecting point. Others were irked at the idea of their property values diminishing, increased traffic pollution or being relocated all together with proposed alignments to the east that would run near or across their property in the process of connecting with Three Springs Boulevard. Grandview Interchange justification based on loaded numbers? One of the engineers that Webb brought in for CDOT’s meeting was Kathleen Krager, of Denver, who said she has over thirty-five years of experience as a road engineer. Krager gave comments about traffic projections for 2030 that were used in the Supplemental Draft Environmental Impact Statement (SDEIS) by CDOT to justify the extra cost of connecting US 550 at the Bridge to Nowhere. A more affordable and less damaging alternative that’s already been thrown out should be reconsidered instead, Krager said. Five more bridges in Grandview? At CDOT’s meeting, attorney Chris Webb—whose property CDOT wants to put the highway through—spoke in favor of building consensus around a solution for where to align US 550. He also warned of CDOT’s plans to put up more bridges in Grandview if they decide to connect US 550 at the Bridge to Nowhere. 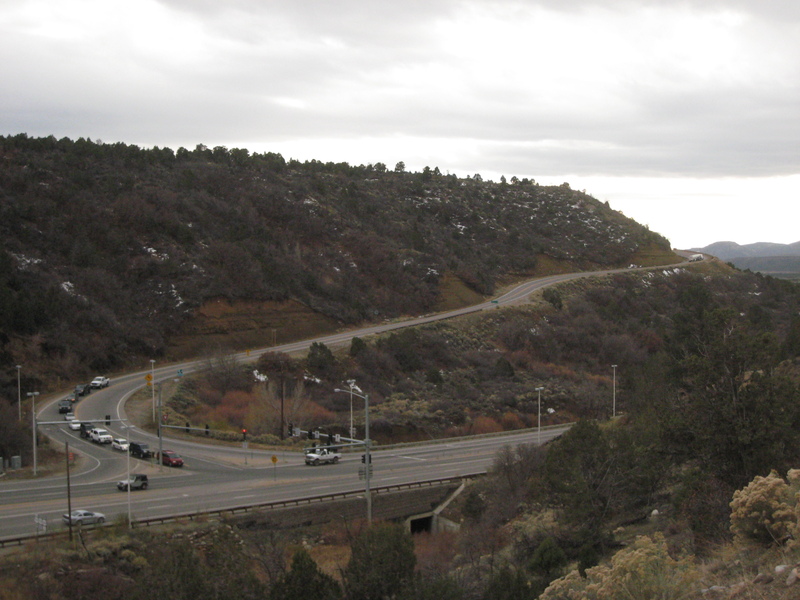 Two bridges would exist at the site of the current Bridge to Nowhere if CDOT chooses to implement their preferred alternative, according to CDOT's Public Relations Manager, Nancy Shanks. Webb brought reality to some people’s request to see the project come to completion immediately. Nancy Shanks, CDOT’s Regional Public Relations Manager, confirmed the planning of up to four additional bridges that would be concurrent with the selection of US 550 Revised Modified G Alternative, which would connect at the Bridge to Nowhere. Bridges one and two would be twin bridges over a draw on the mesa when a four-lane highway from Durango to the New Mexico state line is constructed to meet the objectives called for in the US 550 Environmental Assessment. Bridge number three would parallel the current Bridge to Nowhere if US 550 were to connect there to accommodate the four lanes of traffic. Bridge number four, Shanks said, would be possible on Ramp C, as an on- ramp for westbound traffic on the north side of US 160 to meet the needs of future traffic capacity. It is not clear whether a clover leaf construction is also part of the plans for CDOT’s preferred, Revised Modified G Alternative alignment. In CDOT’s Environmental Impact Statement, the construction of a Grandview Interchange is justified to address both the safety and capacity requirements for the Grandview area. Among safety concerns are two important data points in the SDEIS that stick out as indicators that recent accidents in the US160/US550 corridor could be a result of impatient drivers there as much as a faulty road design. Chris Webb's attorney, Thom McNeill, is rallying CDOT to consider modifying the existing alignment of US 550 on Farmington Hill as a solution to current safety and traffic capacity concerns on the curving, north-facing stretch. More specifically, the northern part of Farmington Hill from MP 15.78 heading down to the intersection with US 160 had the highest concentration of crashes, according to CDOT. Many of those were rear-end accidents related to the intersection with County Road 220. Most of the others were collisions with animals, but overturning accidents were next in frequency at 17 percent. Of 19 accidents on Farmington Hill that involved overturning, sideswiping oncoming traffic or collisions with fences, trees, signs, large rocks/boulders, embankments or a light/utility pole during adverse road conditions, 7 of those took place on curved sections of road. Of six overturning accidents there, three were during icy road conditions, and three were during dry conditions. Steve Winters, an engineer with Russell Engineering, spoke for Webb at CDOT’s meeting about the importance of reducing the design speed on US 550 further south of the intersection with County Road 220 in order to allow drivers time to slow down before approaching the intersection. Currently the speed limit on US 550 changes from 45 mph to 35 mph less than 100 feet before the second turnoff from County Road 220, giving drivers little time to slow before vehicles pull out in front of them onto US 550. 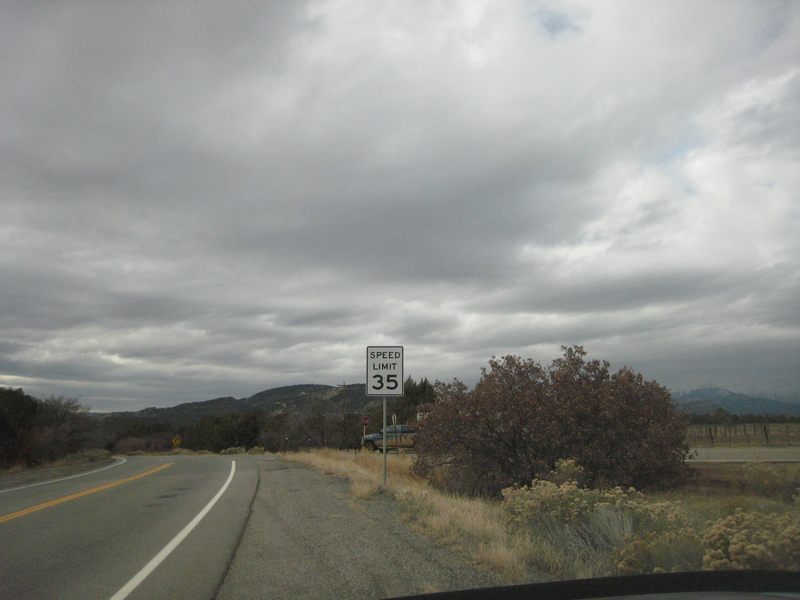 The current reduction of speed to 35 mph on US 550 occurs about 100 ft. from the current accident-prone intersection with County Road 220. To address the problem of collisions with animals, as a requirement of the US 160 FEIS, CDOT recently installed a wildlife fence on the south side of US 160 above a retaining wall. While the retaining wall is too high for animals to jump up and over to the top, it serves the function of saving animals from killing themselves by falling off of it, said CDOT’s Public Relations Manager Nancy Shanks. Thomas McNeill, the attorney for Webb, gave voice to an alternative that CDOT dismissed in its Supplemental Draft EIS that would modify the existing Farmington Hill approach. Known for its tight turns, steep grade and north-facing aspect, the existing Farmington Hill alignment can be widened and modified as needed to correct some of these safety concerns, McNeill said. “What they’re talking about when you drive past that Bridge to Nowhere, and you look at where it abuts to that hillside, is an 880 ft. width cut that’s 120ft. deep and extends about 1400 linear feet,” he said. Steve Winters, an engineer with Russell Engineering who spoke at the request of Webb, also championed modifying the existing alignment. “If you look at the existing alignment, and what one of the proposals is, it’s to shave back the slope, which would greatly increase the amount of solar exposure that you guys would get,” he said. Those were the words of Ignacio resident Dana Abendroth at CDOT’s SDEIS meeting, shortly before calling on those CDOT officials responsible for the recently constructed, yet disconnected Grandview Interchange, to resign. As for a future connecting point for US 550, Abendroth said that it would not happen at the Bridge to Nowhere because Webb is trying to hold up the process by getting his land qualified for the Historical Registry, which is a legal means of protecting a land or property from destruction. 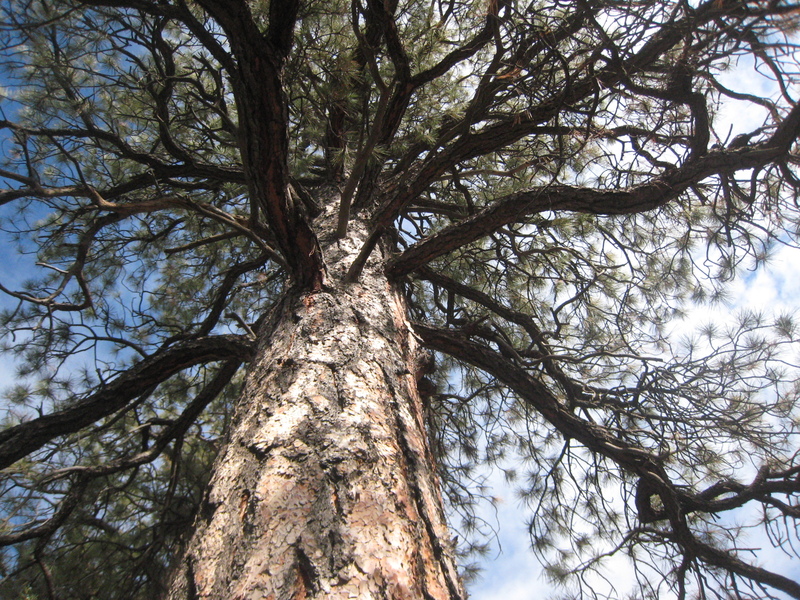 A ponderosa pine waits in limbo on the Webb Ranch as CDOT takes some time to decide if it wants to put a road there in connecting with the Bridge to Nowhere. Chris Webb responded in a conversation to this prediction of him selling out by saying that he would not accept bags of money for his property as a means of resolution. “I’ve seen people who were well off when they died, and they were not happy,” he said. 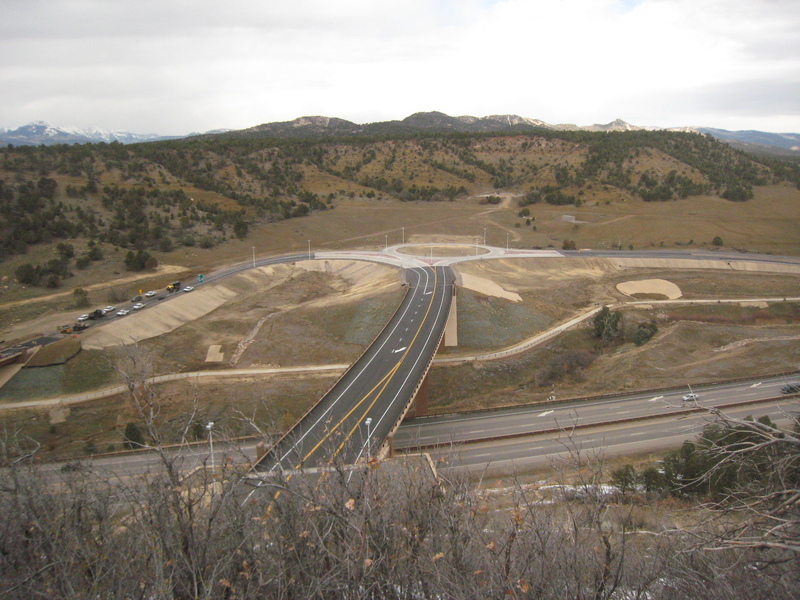 To submit comments on the US 160 Supplemental Draft Environmental Impact Statement, visit: http://www.coloradodot.info/projects/us550-at-160/supplementaldeis/submit-your-comment, or write to Sandra Taylor, CDOT, 3803 North Main Ave., Suite 300, Durango, CO 81301. « Where should CDOT connect US 550 with US 160?